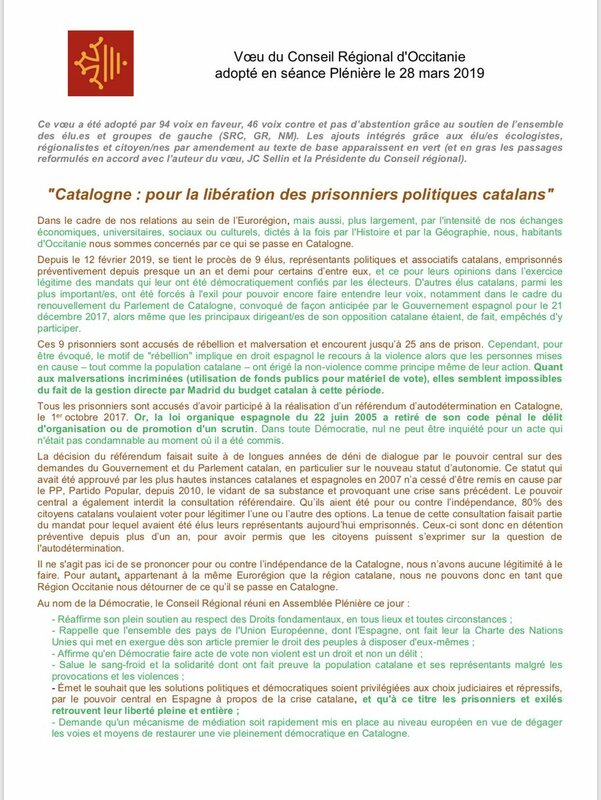 The council of the Occitanie region of France has passed a resolution expressing "concern" about the situation of the Catalan "political prisoners" now on trial in Spain's Supreme Court, and calls on the Spanish authorities to release them. The resolution, which passed thanks to the votes of leftwing groups, says the Catalan independence leaders are being tried for their opinions in "the legitimate exercise of carrying out the mandate conferred on them by those who voted for them." The motion also refers to Catalan leaders abroad, who it says "were forced into exile," and it rejects the offense of rebellion with which the leaders are charged, as it "implies recourse to violence" while non-violence was a principle of both the leaders and the Catalan people. "[Catalan leaders are tried in] the legitimate exercise of carrying out the mandate conferred on them by those who voted for them"
While purposefully avoiding taking a stance in favor or against Catalonia's independence as an issue beyond its scope, the text expresses "full support" for basic rights and states that in a democracy the act of voting "is no crime." French senators urge "respect for fundamental rights"
The resolution comes in the same week that 41 French senators called on Emmanuel Macron's government and the EU to take action in urging Spain to engage in dialogue with Catalonia, a proposal that the authorities in Paris have ruled out. In a manifesto released last Sunday, the 41 French representatives called for "respect for fundamental rights and freedoms in Catalonia" and denounced "repression" by the Spanish authorities, which they argued has led to Catalan politicians being tried for rebellion. The head of Spain's General Council of the Judiciary, Carlos Lesmes, responded by sending a letter to the president of the French Senate, Gérard Larcher, in which he described the declaration by the 41 senators as "unacceptable." According to Lesmes, the declaration criticizing the Spanish judiciary "discrets our conduct as judges and Spanish democracy itself" and he said the views expressed by the senators in the manifesto is the "product of propaganda and interested disinformation." Meanwhile, France has given the greenlight to the project to open the Public Office of the Catalan Language in Northern Catalonia, which was originally put forward in 2016. The president of the Occitanie region, Carole Delga, confirmed on Friday that the office would open in June in facilities of the University of Perpignan. The office will promote the Catalan language but also other aspects of "Catalan culture" as well as the historic links between the area in the south of France and Catalonia itself. It will also allow the two areas to carry out joint projects.